Contains skin soothing allantoin Mildly medicated bar soap. 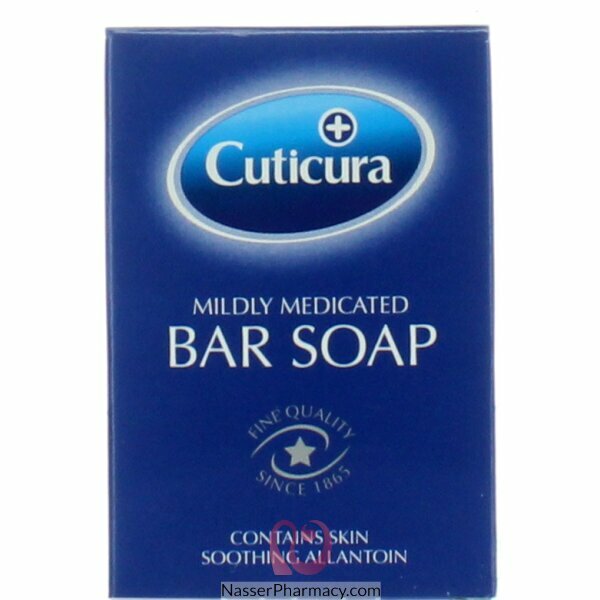 Cuticura' superior action Mildly Medicated Bar Soap is expertly formulated to help provide lasting personal freshness for the whole family. Specially formulated with a blend of an effective anti-bacterial ingredient renowned for its germ removal, as well as soothing Allantoin and Glycerin to help prevent minor skin infections and irritations. Ideal for everyday use on hand, face and body. Use Cuticura Soap during your daily cleansing routine. Can be used on the face, body and hands. Sodium Tallowate, Sodium Palm Kernelate, Aqua (water), Petrolatum, Paraffinum Liquidum, Parfum (Fragrance), Benzyl Salicylate, Coumarin, Butylphenyl Methylpropional, Limonen, Linalool, Glycerin, Triclosan, Allantoin, Sodium Chloride, , CI 77891 (Titanium Dioxide), Tetrasodium Edta, Tetrasodium, Etidronate, CI 77007, CI 77289. Contains alcohol. Flammable, keep away from flame. Avoid contact with broken skin. Avoid contact with eyes. In case of contact, rinse eyes thoroughly with tepid water. Store out if the reach of children. Use only as directed. Do not store above 40°C.